Kaparkan Falls are also known as Mulawin Falls and are found in Sitio Kaparkan, Barangay Caganayan, Tineg in Abra Province. The best time to go to Kaparkan Falls are the months of August and September during the rainy season. Abramazing Tours have regular weekend trips to the Falls during the rainy season. You will need to book your place on one of the Jeepneys. The Jeepneys leave from the DPWH Compound. There is plenty of parking space for those who arrive in vans. Here’s a short checklist of what you’ll need for the day. Dry Bag, Cameras, Spare batteries, Waterproof clothing if you topload the jeepney, Food for lunch, 2L Water, Bag for your trash. The first outsiders only set eyes on Kaparkan Falls in August 2015. Believe it or not even local villagers didn’t know of their existence. They would pass by on a nearby trail going about their daily chores completely unaware that such beauty lay just a few metres away in the lush green forest setting. They knew that there was a waterfall, and that it was dry for seven months of the year, and to them it was the normal state of the falls. Kaparkan was just a place to rest up, drink water and carry on to there destination. They just couldn’t imagine that anyone in the outside world would find exceptional beauty there. Seeing something in a photograph and seeing it in real life are completely different. Photographs will never be able to capture the full beauty of Nature. Photographs take a moment in time and freeze that moment forever. Kaparkan Falls are alive and living. Mother Nature has shaped cascades of natural pools into the mountainside like water-filled rice terraces. Take a closer look around and you will see fallen trees and branches being swallowed up and converted into stone in our own lifetime. Kaparkan’s limestone terraces are continually evolving. 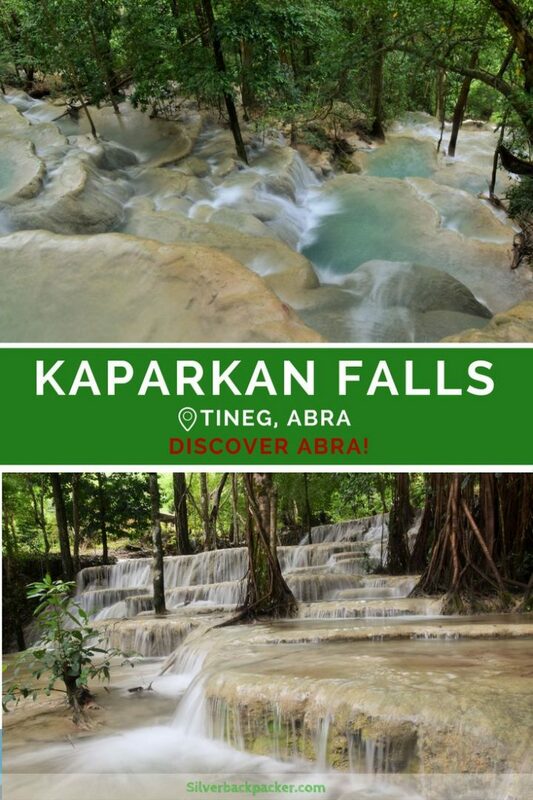 When i first heard about Kaparkan Falls, on my first visit to the Province of Abra, my first reaction was “OK, Lets Go!! ” But a few laughs later, it was suggested that I return in August after the rainy season has started. It is only then that Karpakan Falls is flowing. Most of the year they are dry. The Kaparkan season is from July till September, but if the rains happen to start early then the season could begin earlier in June and even be extended if the rains carry on until October. But i didn’t want to take any chances so made plans to head up to Abra towards the end of August. As the Monster Jeepney called “Hi Lander” left the DPWH compound in Bangued I couldnt help but feel excited. There were ten of us toploading and as we all settled down for the ride, we soon got to know each other. The Jeepney passes through three municipalities on the way to Kaparkan – Tayum, Dolores and San Juan. Keeping a watchful eye out for hanging obstacles such as branches of trees or electric cables that could cause us some serious damage if they caught us unawares, ( the joy of toploading) we enjoyed the changing scenery from our lofty position. After a couple of hours drive, the jeepney came to a halt as it was time to wrap chains around the tyres to help with traction along the deep mud track we were about to pass along. Thirty minutes later we were on our way again. Lurching left and right the Jeepney made its way along the furrows. We would meet locals walking to wherever they were going. The ones heading the same direction as us hopped onboard for a ride.Life up here in these remote hills must be hard. We encountered teenagers out foraging for food, farmers tending their crops of corn and others just walking. The road is so narrow that when the Jeepney came face to face with a small herd of cows it could not pass, and the cows had to trot infront until the track opened up wide enough for us to pass. After about 90 minutes we arrived at the jump off point where we would hike the rest of the way to Kaparkan Falls. 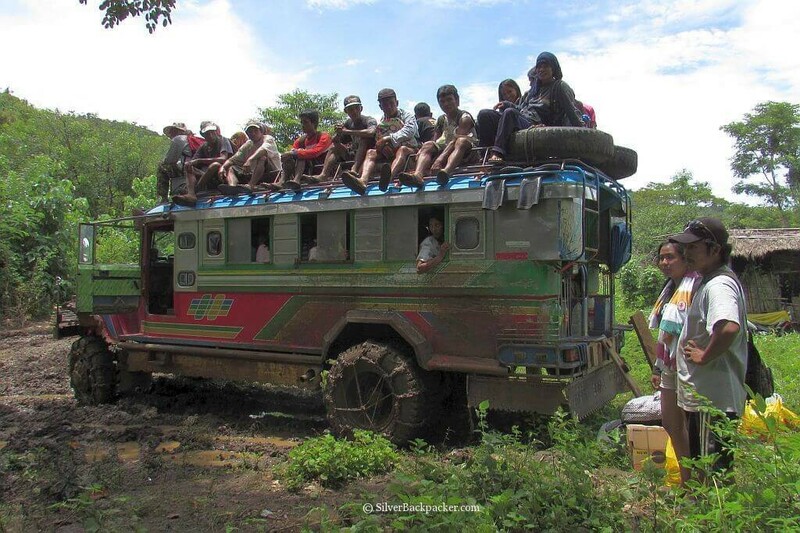 A crowd of about fifty locals were waiting patiently under a tree for our impending arrival, and even before we had all alighted they were clambering on board for a ride to the other end of the mud track. We survived the challenges of the trail to Kaparkan. Kaparkan’s multi-terraced limestone wonderland stretches for about 500 metres from top to bottom. Lounge in one of its crystal clear pools or climb Kaparkan’s staircase. The limestone edges of the pools look slippery but are actually very safe to walk along barefoot. Explore, enjoy and immerse yourself in the beauty and natural wonders of Kaparkan, but please do not vandalise, destroy or damage anything. This wonderland has been created slowly over millions of years. 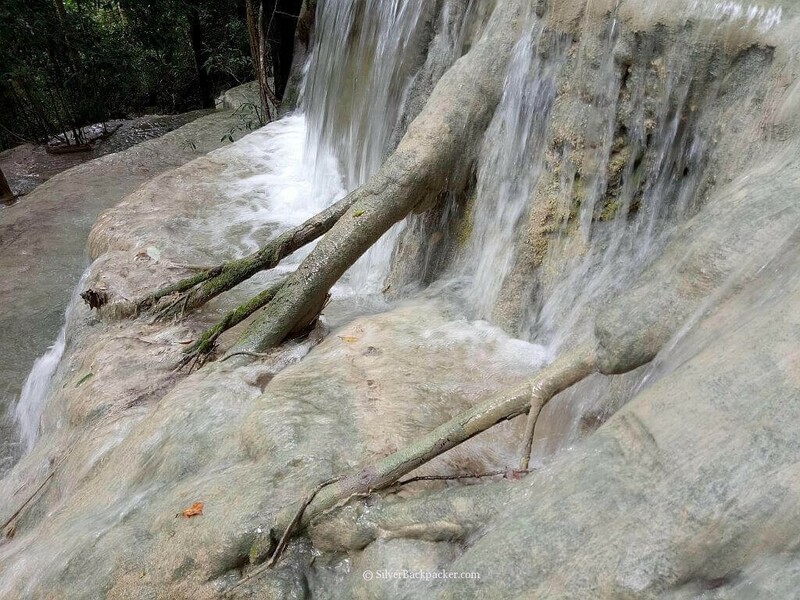 Did you like “A Guide to Kaparkan Falls” ? If so then please share this page with your friends. Very nice place. I love waters…. I am planning a visit on January 12-13, 2019. Will I see the water flowing in that time of the year? Kaparkan Falls are only open during the rainy season from End June to late October. So, unfortunately there will be no water flowing. Hi, Is there a registration process that needs to be done first? The kaparkan season has finished until July 2019. Please contact Dykath Molina on 092 777 258 56 or on the Abramazing Tours facebook page for more information. You can fly or take the bus to Manila and from Manila take a Partas or Dominion bus from Cubao to Bangued, Abra. Please note that Kaparkan Falls are only open from July to October during the rainy season. Is there a nearby accommodation in Tineg? There’s no accommodation in Tineg. You could camp out though if you have a tent or hammock. Excited to visit this majestic falls. How much is the fare cost from the jeepney ride back and forth? How many hours is the jeepney ride to the drop off ot? From Bangued the trip takes around 3 to 4 hours to Kaparkan. Then there is a 30 minute hike to the falls. 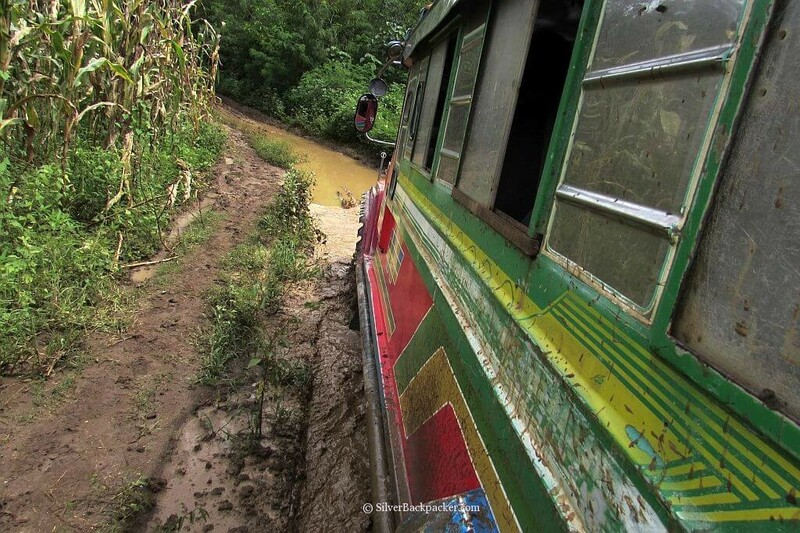 The road to Kaparkan is not suitable for 4×4 that do not have a high wheelbase, winch, and tyre chains. If using your own vehicle be aware that a rescue and recovery will be very expensive.It is best to book a Kaparkan trip with Abramazing Tours. You can find them on facebook. how many hours of trekking from jeepney jump off to Kaparkan falls? thanks! Its a 20 to 30 minute hike from end of the jeepney trail to the falls area. How did you get back to bangued? There is a jeepney that leaves DPWH, Bangued in the morning and returns in the afternoon from Kaparkan. You need to book with Abramazing Tours to reserve your place on jeepney. I was there Oct. 22, 2017. If you are looking for something different & needs physical adventure, go ! The experience is really unforgetable considering the challenge inside or on top of the jeep just to reach the destination. Absolutely worth it once u see the spring terraces flowing, amazing ! I was at Kaparkan Falls the same day as you then !!! Were we on the sameJeepney?? I took the later ride at 08.00. What a beautiful place, and quite an adventure with cows, locals and mud. A lot of the things I am looking for when planning a trip. Would love to make this day trip! At this time, March, is there any water flowing even a little or is it literally dry? I have not been there in March, but i know that there is no water flowing down the terraces. The beauty of waterfalls come into their own during the rainy season as the falls are full with water. 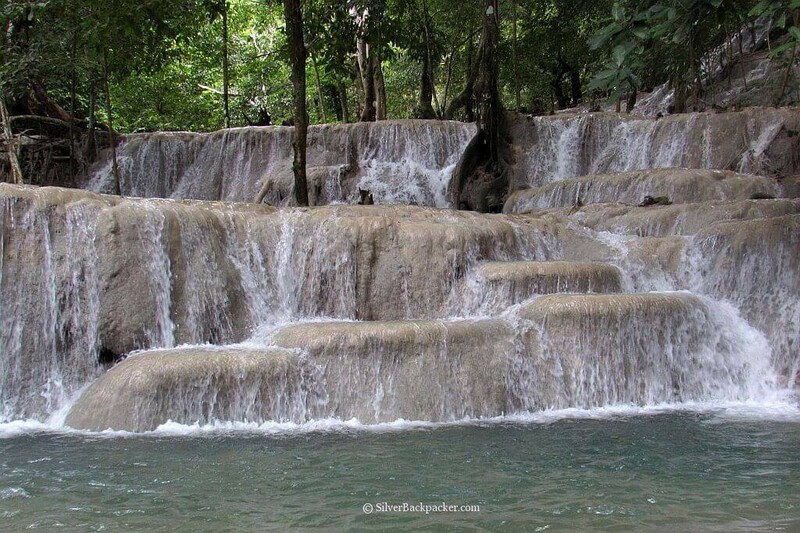 The Kaparkan falls is another amazing treasure from the treasure trove of the Philippines. We love waterfalls as they have a magical and soothing effect on the senses. The Kaparkan waterfalls looks enchanting and definitely a place to visit. What a gorgeous waterfall. I would love to visit it one day. So much beauty in the Philippines. Incredible that people know about this wonder since 2015. Did you have a bath on the falls? Good to know that rainy season is the season to go, just when I usually have holidays! How is the rest of the country during the rainy season? Wow, these are just beautiful. The way the geology has created shelves, each one a little pool, is just amazing. I love waterfalls and getting off the beaten path! I would definitely do this adventure, even if it meant getting stuck in the mud:) Can you swim here?